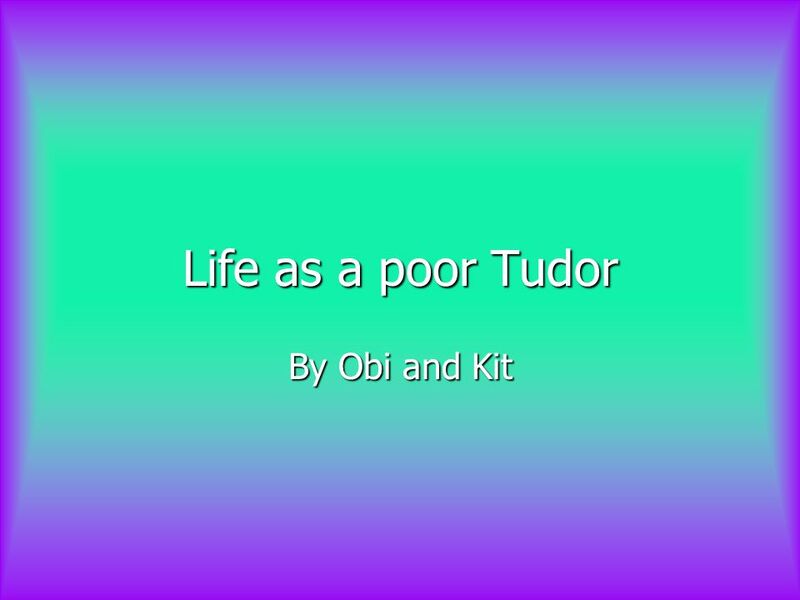 Life as a poor Tudor By Obi and Kit. Contents How would you earn a living? How would you earn a living? How would you earn a living? How would you earn. 3 How would you earn a living? Often the jobs for the poor would be harder than the jobs for the rich. Peasants would often work in farmlands. The church would usually own the farmlands that the peasants worked on. Sometimes poor Tudors would work in the kitchens in palaces but some monarchs thought they were really dirty. 4 How much would children have to work? 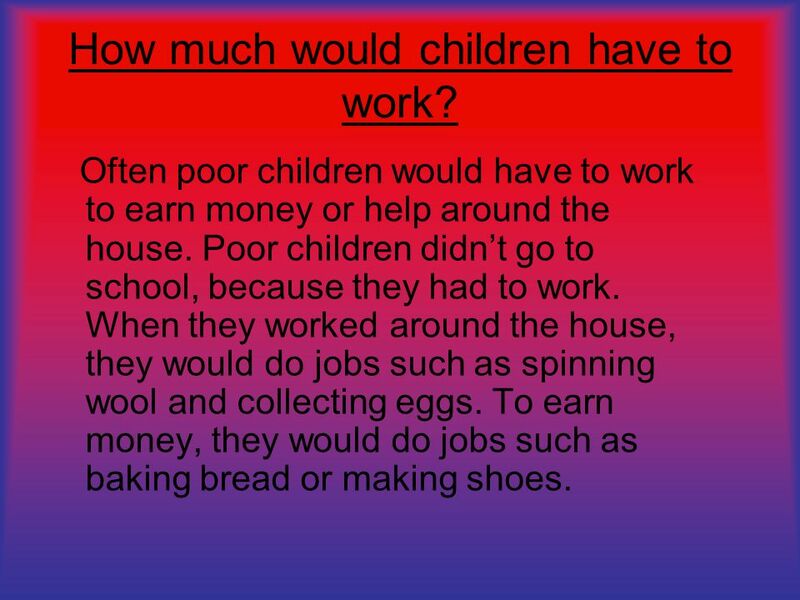 Often poor children would have to work to earn money or help around the house. Poor children didn’t go to school, because they had to work. When they worked around the house, they would do jobs such as spinning wool and collecting eggs. To earn money, they would do jobs such as baking bread or making shoes. 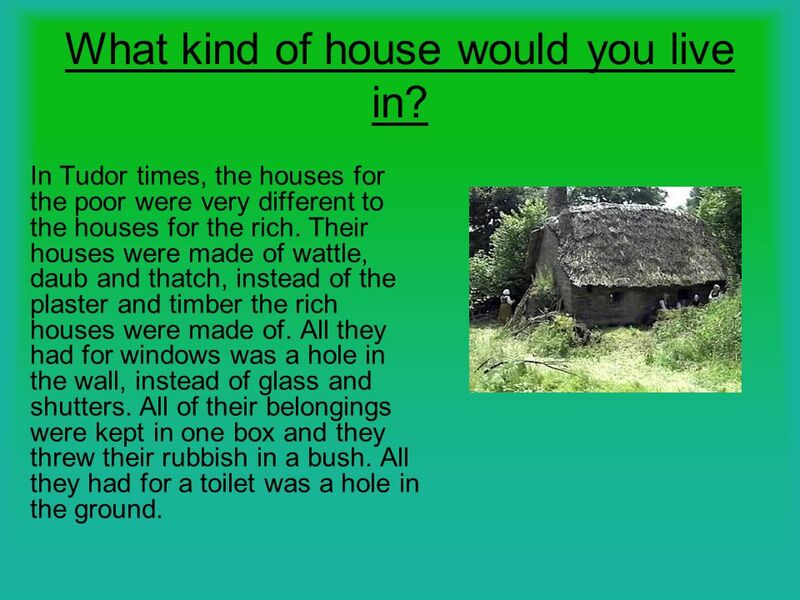 5 What kind of house would you live in? In Tudor times, the houses for the poor were very different to the houses for the rich. Their houses were made of wattle, daub and thatch, instead of the plaster and timber the rich houses were made of. All they had for windows was a hole in the wall, instead of glass and shutters. All of their belongings were kept in one box and they threw their rubbish in a bush. All they had for a toilet was a hole in the ground. 6 What kind of clothes would you wear? 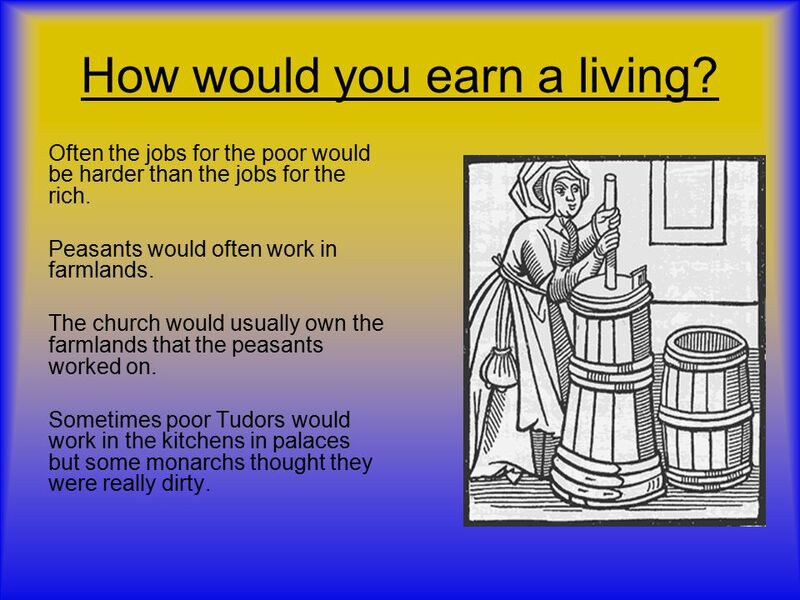 Poor people in the Tudor times didn’t have as many belongings as the rich. One of these types of belongings were clothes. They had to wear one set of clothes for a week. Some people actually made their own clothes out of poor materials such as wool. lower class people were only allowed to wear wool, linen and sheepskin. Men wore a hose of wool and tunic, while women wore a dress of wool, apron, cloth bonnet and linen scarf. 7 How would you be treated? Because the poor were not as well-off as the rich, they were treated differently; either harshly or sympathetically. If a poor person was able to work but wouldn’t work was caught begging, they were treated harshly. Merchants would often treat the poor who couldn’t work sympathetically. Sometimes rich people would provide tramps with houses. 8 What kind of food would you eat? 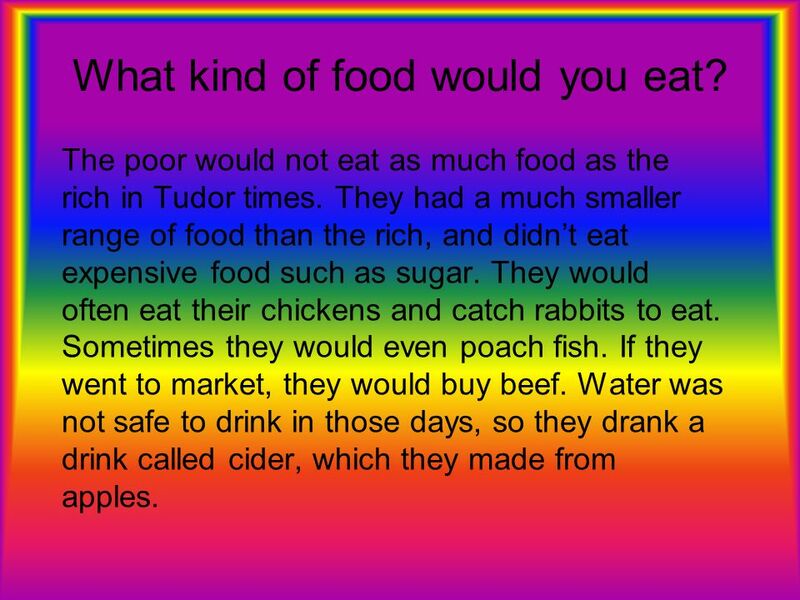 The poor would not eat as much food as the rich in Tudor times. They had a much smaller range of food than the rich, and didn’t eat expensive food such as sugar. They would often eat their chickens and catch rabbits to eat. Sometimes they would even poach fish. If they went to market, they would buy beef. Water was not safe to drink in those days, so they drank a drink called cider, which they made from apples. 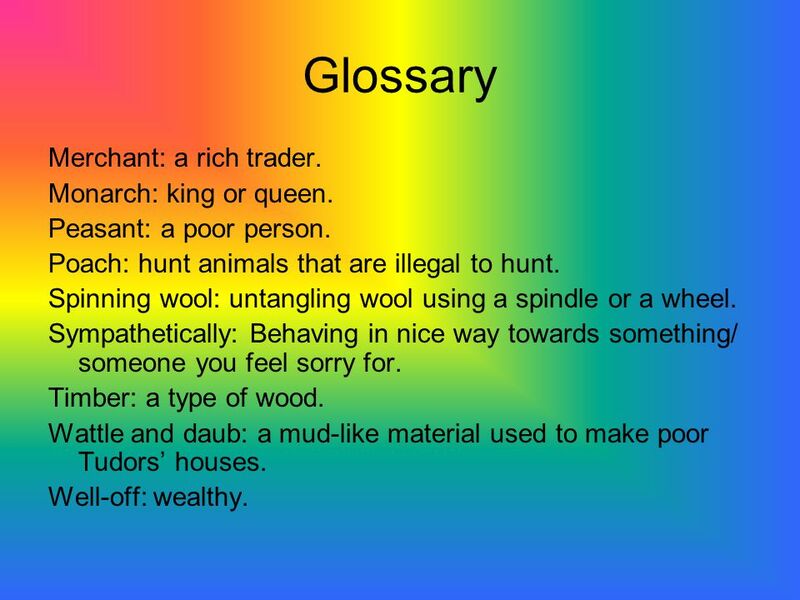 9 Glossary Merchant: a rich trader. Monarch: king or queen. Peasant: a poor person. Poach: hunt animals that are illegal to hunt. Spinning wool: untangling wool using a spindle or a wheel. Sympathetically: Behaving in nice way towards something/ someone you feel sorry for. Timber: a type of wood. Wattle and daub: a mud-like material used to make poor Tudors’ houses. Well-off: wealthy. 10 Index Merchants: slide 7. Monarchs: slide 3. Rich people: slides,5,6,7,8. Rubbish: slide 5. Sugar: slide 8. 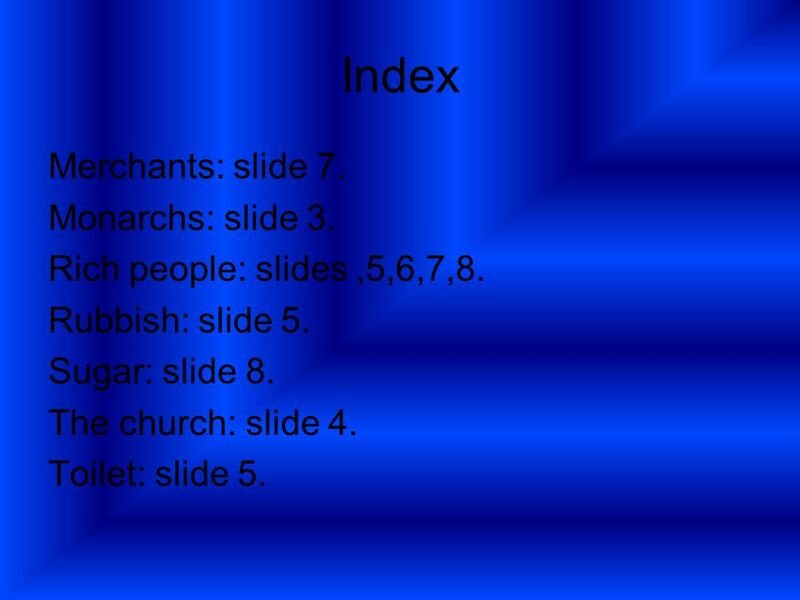 The church: slide 4. Toilet: slide 5. Download ppt "Life as a poor Tudor By Obi and Kit. Contents How would you earn a living? How would you earn a living? How would you earn a living? How would you earn." What was life like in the time of Thomas Mansell ? By Ru & Bailey. By Chloe Sutter, Stephen Davidson and Bailey Manning. Tudor Fashion - The Rich The Rich Wealthy Women Wealthy women wore many layers of clothes. They had many petticoats. They wore long gowns made out of. 1 The Celts Who were the Celts? Hannah Tait.  At that time they had a lot of rich food.  There food was also very posh not like the food we would eat.  They really liked meat and. Click here to view video. All about the Ancient Egyptians life. 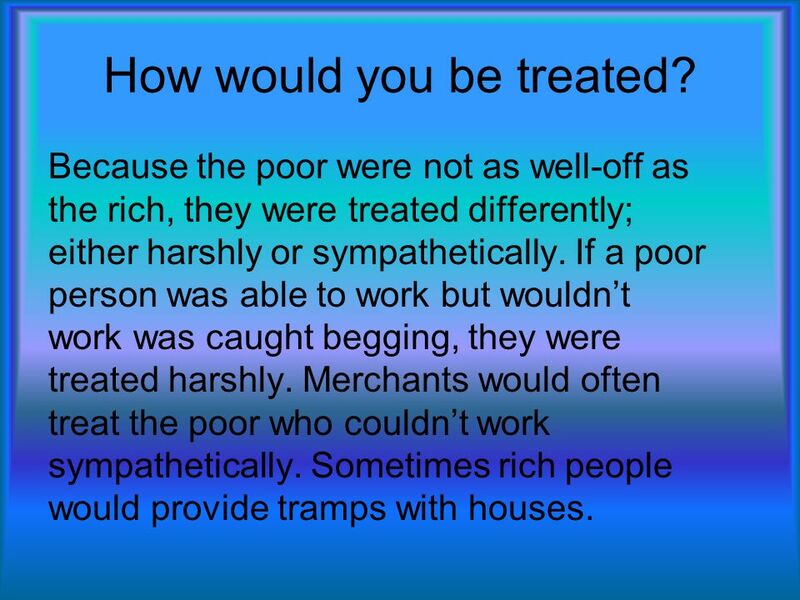 Rich and Poor in The 1500’s By Maria Hatfield P5a. ANCIENT EGYPT by RORY MALONE. FOOD  Bread was very important in the ancient Egyptian diet. Harvested grain was stored in huge granaries until needed. A Leap in the Park. This is about how people lived in Mary time by Declan Maguire. Bishops were important men in the church. Barons were very wealthy and powerful men. In return for the land they promised to obey the King and supply. My Viking project By Orla Kelly. Where did the Vikings come from? The Vikings came from Norway, Sweden and Denmark, it was known as Scandinavia. They. In Tudor times there were no synthetic fabrics. All Tudor clothes were made from only natural fabrics – fabrics that came from animals or plants. These. Clothes in the past History. THE VICIOUS VIKINGS!. Viking longboats Viking food Why they came to Britain? Where Vikings invaded Their Homes Viking clothes Contents page!